The 2018 Nebraska recruiting class includes some high-profile players so far, but there is one position missing in action to this point. There has not been an offensive tackle recruit to verbally commit and that is a position of need for this cycle. Rising 3-star offensive tackle Cade Beresford (6-7, 250) holds a Nebraska offer that he picked up after coming to the first Friday Night Lights camp in Lincoln on June 16. The former quarterback that never stopped growing has seen his recruitment pick up over the last month quite a bit. I was able to catch up with him after his camping trip and find out where he stands with his recruiting process now. HV: How is your summer going and what are you working on with your workouts? CB: I’d say this summer I’ve really just tried to pack on more weight. I was about 250 at the beginning of the summer and I want to be about 260, 265 going into the season. Really trying to work on my weight right now and my pass protection and stuff. My footwork and pass pro, getting that ready for the season ahead. Staying in shape, those kinds of things. HV: What are you and your parents looking for in the school you choose? CB: I’d say the biggest thing that always comes first is academics. Where I can find my degree and obviously Nebraska fits that pretty well. Also where I can get good academic support with the tutors on staff. Another big thing for me is somewhere I could see myself going to college without football. Somewhere where I could have a good experience for college, where I could enjoy life outside of football. Somewhere I can get along with the coaches and players, that’s going to be big for me. 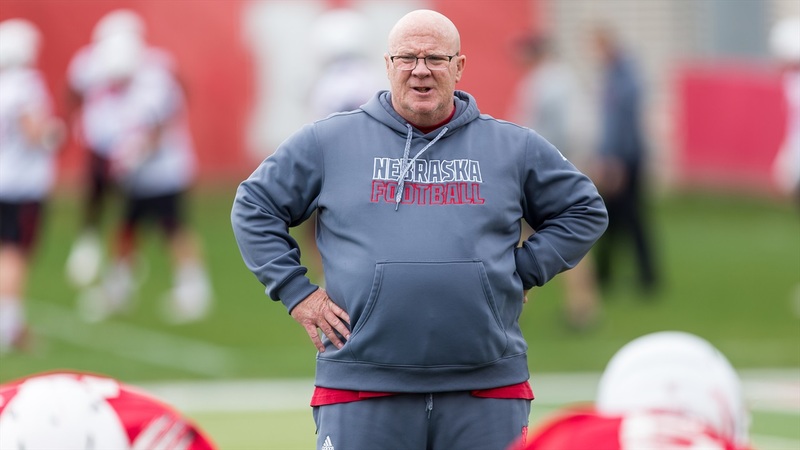 Going out to a place like, lets say, Nebraska, I’m definitely going to have to be close to those guys, close to the coaches off the bat and make those connections quick with the players. HV: You’ve picked up some Pac-12 offers since Nebraska offered, is distance a factor? CB: No you know with the Pac-12 schools, all those schools are pretty close. My parents and I are not really worried about that. I’ll go wherever, far away or close. If I could see myself going to Nebraska, I’ll do it. I know my parents will get out there, I could see them a bunch. I think we could make it work wherever it is. I don’t think that’s going to be a problem. HV: What stands out about Nebraska to you? CB: The coaching staff really stands out to me. Mike Riley has done some big things, they’ve had a great team the last couple of years with a 9-4 record last year which is pretty good. Coach [Mike Cavanaugh] is one of the best if not the best line coach in the country. Facilities wise, the stadium is amazing; its fits 90,000 people so it would be cool to play in front of all those fans. They all know who you are, its awesome. Their weight room is very nice, the locker room is nice too. One thing that really stood out to me was the tutors on staff. They have about 14 tutors on staff to help out with academics and that’s going to be big for me going down to a place like that and focusing really hard on academics outside of academics. HV: Do you have a timeline to make a decision and where does Nebraska stand? CB: Nebraska is one of my top schools right now and I’m not sure on timeline. It could come sooner rather than later. HV: Do you have plans for an official visit to Nebraska? CB: I’m not sure how many official visits I want to take just yet. If I commit somewhere early, I’ll probably just take my official to where I commit. I was planning on taking all my officials but now that I kind of want to do an earlier commitment, I might not. But wherever I commit, I definitely want to get out there with my family for an official visit. Cade played things pretty close to the vest when asked about his timeline for a decision and where Nebraska stands but I would say that Nebraska does fit a lot of the criteria Beresford and his family have laid out with coaching staff and academics.